The Resident Offspring came home sick on Friday and I succumbed yesterday. The Spousal Unit got the hell out of Dodge on a business trip this morning before he too succumbed to the biohazard waste dump that this house has become. I'm hoping to nip this in the bud and contain it to merely razor blades in the throat. And hopefully the youngster will bounce back to health before we leave on our trip to Vancouver/Victoria on Monday. The Resident Offspring and I are never usually sick at the same time, so this is the first time that I have curled up on the chesterfield and watched daytime tv with her. Three hours of RuPaul's Drag Race sure makes you forget that you are on the verge of death. What a fierce show! The pictures that my sister-in-law and brother sent the other day also give me the desire to stay alive. 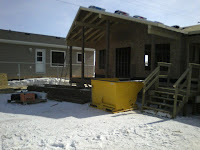 They took some photos of the cottage that we are having built in Manitoba. Come August, that baby is going to be moved to our little patch of lakefront there and we will become familiar with all the social activities that Oakburn has to offer. Let's see, there's bingo at the community hall and you can rent dvds at the grocery/liquor store. Good times, good times. I LOVE Rupaul's Drag Race! Haven't missed an episode yet AND have even watched the reruns. Does that make me sad and pathetic? WHo cares! I love Shennel! And Angina. It was so sad to see her get the book this week. How Rebecca Glasscock (hey...it's her name!) managed to make the final four, I'll never know. I don't know what I'm going to do while I'm in England. I'll miss the last couple of episodes. Egads. Hey, my work verification? Unneat. Hmmm, Blogger really knows me! Oh! I will come play bingo with you! Oh, I must have been watching old episodes because I didn't know Ongina was kicked off. Well, I'll probably never get a chance to watch again, so you are forgiven for spoiling it for me, Karen haha! You'll be catching those episodes on rerun next time you are sick, I guess. 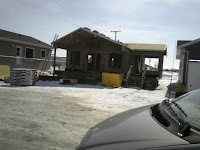 Just south of Riding Mountain National Park, Kelly. Not that far from Rossburn. Yay! I am looking for a bingo buddy, Justrun. You are on, my dear. Have a great trip as well. Send get well wishes to you and the RO! Everyone seems to have caught a cold this week. I hope you both get well soon! You're moving the cottage? Like on Monster Moves? Awesome. That'll be ace. Thanks, Jas. I hear it nothing but rain there right now. Which is better than snow, I guess. It's some nasty cold bug that's going around too, Al. We are working on our health. Wilderness time is going to be strange, and might take me a bit of getting used to. But I am game. Yes, they rip down the highway at 80 km/hr, I am told, Kees! It's a very good thing I won't personally be there to see it, as I would be shrieking at every turn. 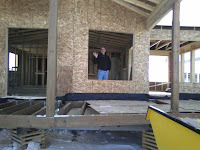 I just smile thinking about the fun you are going to have in your new cabin. What a thrill! So you're on the down-low too. I'm finely feeling somewhat improved today. Actually felt like practicing the piano but no woodwind instruments. No woodwinds for another 10 days, Leazwell! Get better soon. And yes, thinking of welcoming friends to our little getaway place is a great way to while away the sick days.